Since 22 June, Mixmag and Coors Light have taken over Rooftop Nine for a series of special Labs from the White Isle. 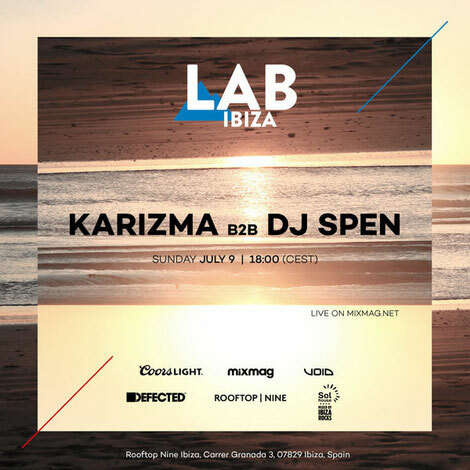 For the final instalment of The Lab IBZ, the brand will be hosting a Defected takeover with Karizma and DJ Spen spinning back-to-back. Karizma’s innovation in the field of DJing has impressed across his career, with the Baltimore native showcasing his skills of manipulating music in different ways. His R2 Records imprint has also been responsible for bringing sounds from the likes of Ron Trent, Osunlade and Louie Vega to the world. Fellow Maryland artist DJ Spen has been in the game for three decades and has made an impact on the global dance scene with releases on labels such as Defected, Black Vinyl Records and the output of his own Basement Boys Records, which counts Glenn Underground and Ultra Naté among its roster. Both DJs have a longstanding relationship Defected, including their remix of ‘Bad Habit’. Following The Lab session, the two will be playing in tandem at Defected’s residency at Eden, plus you can also catch them at Glitterbox parties at Hï Ibiza and Defected Croatia festival across the summer. You can tune into their Lab IBZ appearance at 5pm BST on 9 July via mixmag.net.